On Tuesday night, the union representing striking teachers in Los Angeles reached a deal with the Los Angeles Unified School District, ending a weeklong strike that had drawn broad support from parents, Los Angeles residents, and leaders of the Democratic Party. Teachers will be back in their classrooms on Wednesday morning. The deal includes caps on class sizes, and hiring full-time nurses for every school, as well as a librarian for every middle and high school in the district by the fall of 2020. The union also won a significant concession from the district on standardized tests: Next year a committee will develop a plan to reduce the number of assessments by half. The pro-charter school board agreed to vote on a resolution calling on the state to cap the number of charter schools. Teachers also won a 6 percent pay raise, but that was the same increase proposed by the district before the strike. 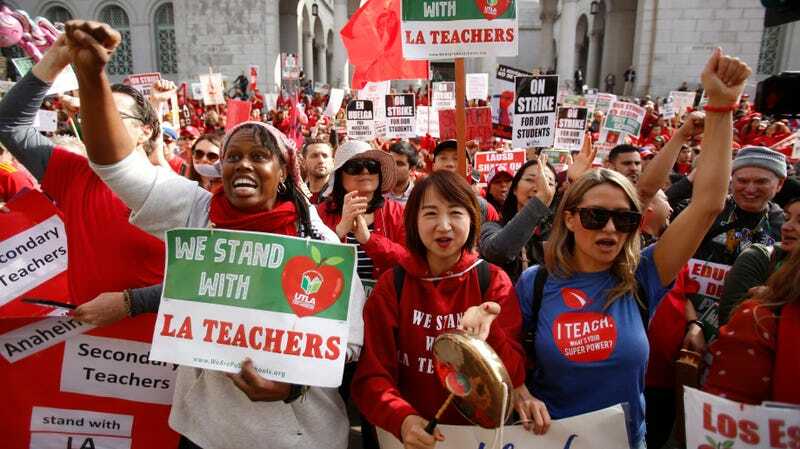 The teachers union, United Teachers Los Angeles, had called for a 6.5 percent raise as well as the hiring of more teachers and support staff to reduce overcrowding and provide much-needed services to students. The district also agreed to expand to 28 the number of schools that will no longer conduct random searches of middle and high school students. That provision was especially important to students who marched in support of their teachers. As many have pointed out, the gains won by the strike are not limited only to contract wins; from the 2012 teacher strike in Chicago to today, there has been a marked increase in support for the idea of teachers taking militant action to protect not only their livelihoods, but the needs of their students and more broadly, the idea of public education. Other major American cities and states are now facing a possible school walkout, even as Los Angeles reached a settlement. Teachers in Denver began voting over the weekend on whether to strike after negotiations with the city’s school system failed to produce an agreement on Friday, local news outlets reported. In Virginia, teachers are planning a statewide demonstration later in January. And teachers in Oakland, Calif., said they had drawn lessons from Los Angeles teachers and were now preparing to vote on a strike.